I didn't have much interest in either Sharknose Ridge or Red Hill. I was really after Overlook Mtn, a 10Kft/P900 deep in the Golden Trout Wilderness, about as far from any TH as a peak there can get. It would have made for a monstrous dayhike approaching 40mi and I frankly wasn't up for it - such adventures are no longer as appealing as they were a few years ago. I figured a more enjoyable way to reach it was via a short backpack trip out of Horseshoe Meadows. Sharknose and Red Hill, then, were really just a couple of named points along the way that I could tag while hiking in. With a few free days, it seemed a good time to do it because almost everywhere in the state was forecast to be hot. Horseshoe Meadow starts high, near 10,000ft and the lowest I'd have to go was around 8,500ft. Leaving San Jose following my daughter's volleyball game, I reached Walker Pass sometime after 1a where I spent the night quite comfortably. 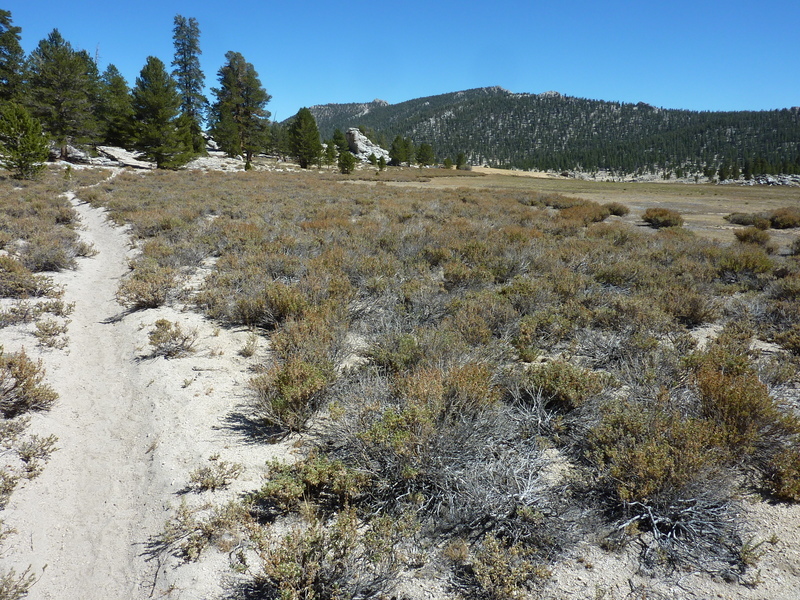 In the morning I drove to the Lone Pine Visitor Center to pick up a permit and then continued up to Horseshoe Meadow. It was 10a before I was ready to head out, but I hardly needed an early start since I wasn't planning to do too much. It was my first foray into backpacking since my ignominious effort back in June when foul weather made a mess of my plans. Weather would not be a factor this time, except perhaps that it was a little too sunny and warm for my liking. The choice of trails was pretty decent. Trail Pass is one of the easiest High Sierra passes to get over, requiring only about 500ft of climbing from Horseshoe Meadow in about 2mi - only Tioga Pass via car is easier than that. Heading down the south side of Trail Pass one can get a view to Kern Peak poking up in the distance, though most views are muted by the forested slopes one travels through. After realizing I'd already done most of the elevation gain for the day, I started thinking this was a little too easy and began changing the plan on the fly. I was going to save Sharknose Ridge for the hike out but it seemed a better idea might be to climb it on the way in when I had more time, so about a mile down the south side of the pass on the way to Mulkey Meadows I left the trail to head more directly to Sharknose. The ridge looks pretty nondescript from Mulkey Meadows and I could see nothing that might suggest its fanciful name. The north side of the meadows are striped with a bunch of cow trails, evidence of many years of use and abuse. Petrified cow patties lay seemingly everywhere. I thought the grazing areas would be confined to those areas closest to the various THs throughout the Golden Trout Wilderness but that was hardly the case. I saw evidence of grazing in every meadow I visited, some more than 15mi from the nearest trailhead. It was only later when I was doing some online research that I realized how extensively this whole region had been grazed up until the creation of the Golden Trout Wilderness. Though the number of cattle has been greatly reduced, they still seem to have access to most of the wilderness meadows, sadly. On the south side of the meadow I took off my pack and left it at an old campsite, A rusty shovel head suggesting a stock camp, not backpackers. With a far lighter load I headed south up forested slopes, climbing about 1,200ft in a little over a mile to reach the highpoint of Sharknose Ridge, found to the south of several lower rocky sections along the ridge. These I bypassed on the east side for the ascent, finding the west side on the descent more direct and easier. The summit offers unobstructed views across much of the Wilderness and into the high country of SEKI NP. Exactly where Overlook Mtn lay to the west eluded me. Undoubtedly it was one of those lower forested humps off in that general direction. After taking in the views (and not finding a register as would become the norm on this trip) I returned to Mulkey Meadows and my pack. I took a break for some lunch before reshouldering my load and continuing. I spent the next several hours making my way southwest to Tunnel Meadow. After a gentle rise to a very shallow saddle between Mulkey Creek and the South Fork of the Kern River, the trail begins descending into the latter's drainage, following it through the two mile-long Tunnel Meadow. This is the first useable water I came across, a welcome relief since I was only carrying two quarts from the start. Tunnel Meadow has some interesting Sierra history. At one time there was a dirt airstrip used mostly by a guy named Bob White who would fly folks in to the 9,000-foot airstrip for fishing, horseback riding and other backcountry pursuits in this miles-from-anywhere location. The runway is still visible in the meadows, but unusable now, decommissioned when the Wilderness was created. The nearby corral is in disarray and if any of the structures (a camp here run by Bud Loniker catered to the folks brought in by Bob) are still standing I didn't see evidence of them. A mile and a half away at the southwest end of the meadow is something called the Tunnel Station, manned at one time by the Forest Service mainly for fire suppression (possibly still is, but no one there when I visted). The water tower is defunct but the building appears to be still used, at least occasionally. It's an interesting location where the Golden Trout Creek (which flows to the Kern River) and the South Fork Kern River come within a few hundred yards of each other, separated by a low rise. A tunnel was built here to divert water from the Golden Trout Creek, eventually causing bad blood between ranchers grazing opposing meadows. The tunnel was either blown up or collapsed on its own, but was from where the meadow's and station's names derived. For more of this fascinating history can be found online. There are multiple trail junctions in the vicinity of Tunnel Station with Overlook to the west and my other main objective, Templeton, to the southeast, so somewhere around here is where I intended to set up camp for a few nights. I followed the trail fork down the South Fork Kern River for about half a mile until I found a flat place alongside the creek I could source water and rinse off. As it was only 4:30p with plenty of daylight, I left my pack here and headed off for nearby Red Hill. It's one of several cinder cones in this volcanic area, and at 9,460ft it's the highest of 39 similarly designated landmarks in the state - yay. It's a pretty tame cross-country scramble from most directions with enough vegetation on its sides to provide decent footing (with the exception of the descent route I took directly east off the summit - steep bootskiing to the trail, definitely not recommended for the ascent), and few trees along the crater rim to allow nice views of Kern Peak and the surrounding countryside. The whole outing took less than 45min.